The Half Trog (Beast) is a 9 mile fell race covering the moors between the Luddenden Valley and the Keighley Road. It starts at the Hare and Hounds in Old Town and takes in the bogs, and pathless wastes of Midgley Moor and High Brown Knoll, dropping down to Upper Dean Reservoir at the top of the Luddenden Valley. Nearly 10 miles in total. 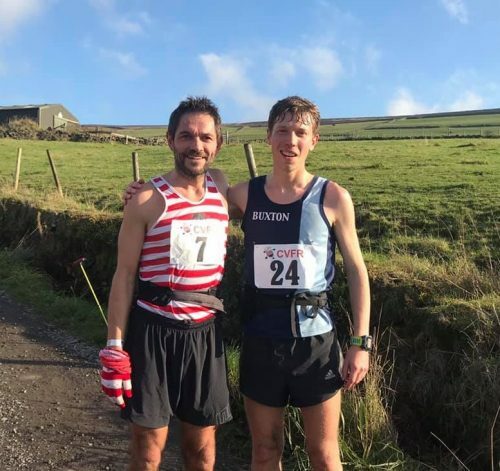 Last Sunday Calder Valley Fell Runners hosted the race with 68 runners starting but only 61 finished, 7 dropping out as the moors got the better of them. 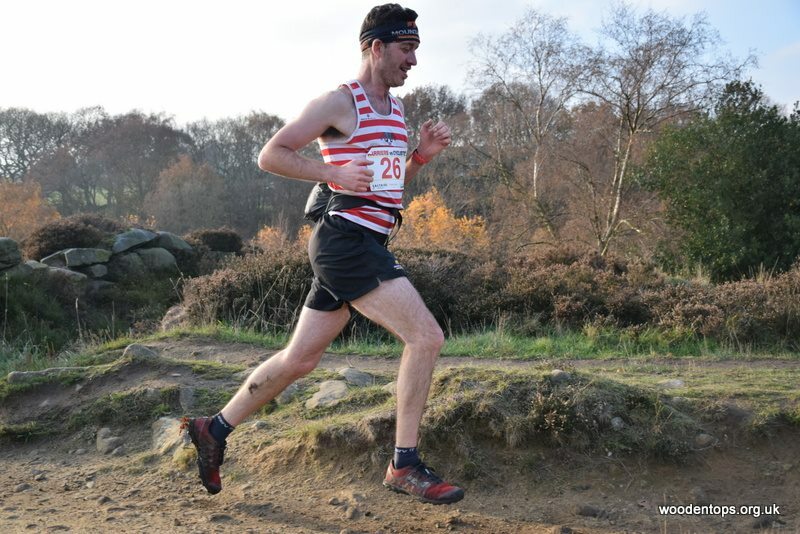 However Calder’s Karl (Machine) Gray got the better of the moors and the race by winning in a new record time of 1:09:29. He was chased round the course by Alasdair Campbell of Buxton AC who was never more than two seconds behind him for most of the course, Karl only outsprinting him in the final run in to win by 6 seconds. The women’s record holder, Nicola Jackson of Ribble Valley, was first woman back in 1:19:54 in 6th place overall. 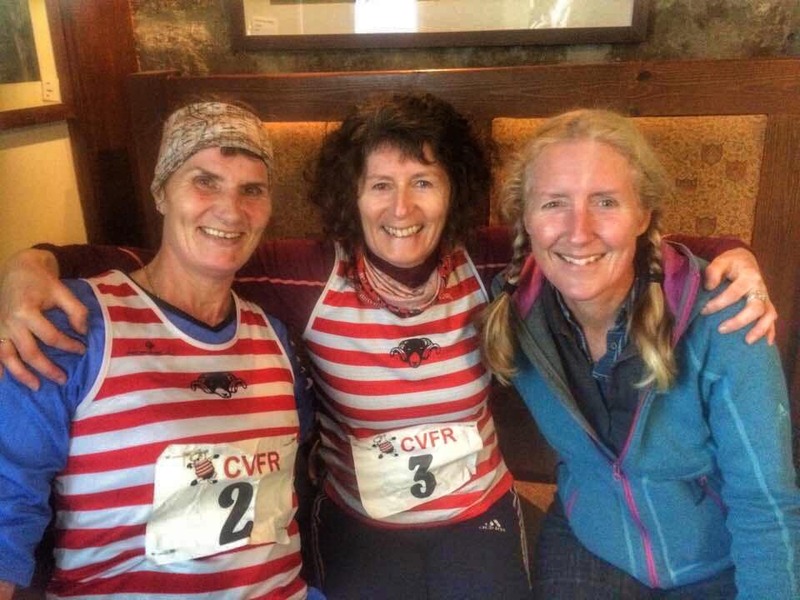 Jackie Scarf, Amanda Farrell and Sue Martin took the women’s team prize for Calder Valley. The final race of the Calder Valley Annual Club Championship was held on Saturday. A rare type of race in that the fell runners and cyclists head off at the same time on a five mile route from Shipley Glen climbing some 1000ft around Baildon Moor. The runners have the advantage on the climb with the cyclists having a gravitational advantage on the descent. 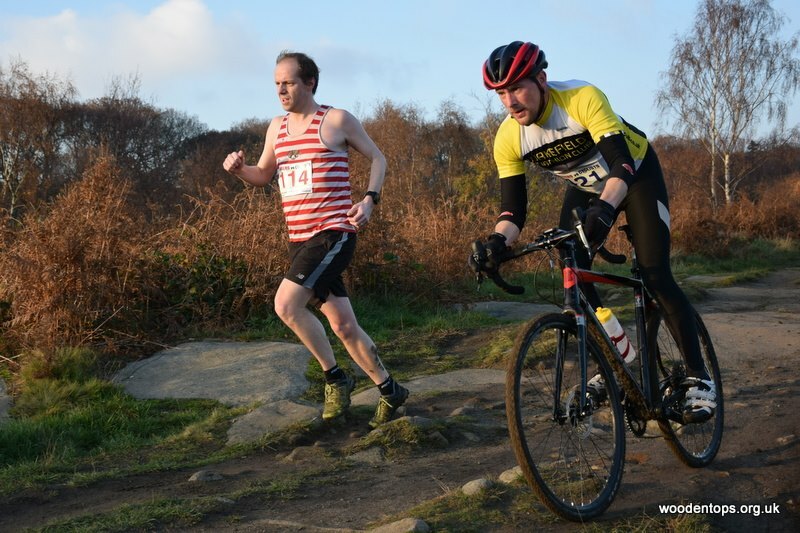 The race was won by Rob Jebb, an athlete who has won both the Three Peaks Fell Race and the Three Peaks Cyclocross race. With pedigree in both camps he chose to race by cycle on Saturday. No results out as yet but some good photos available. Details along with the final club championship positions next week. A seventeen mile torture fest of climbing six different ways over Pendle Hill. Why would anyone do that? Well it seems to be popular amongst the fell running community and in particular 16 members of Calder Valley Fell Runners. Despite the last race in the CVFR club championship being held on the same day these 16 decided to do a race that was more than three times as far and with five times as much climbing as the Harriers v Cyclists. No results are out yet but the run of the day has to go to Ian Symington who was running well, near the front of the pack just after the 1st checkpoint, when he came across injured runner Mark Burley who had stood on something sharp which lacerated his shoe and foot. Ian, along with some other runners stayed with Mark, wrapping him up in the emergency blankets kindly donated by other runners and all putting on their own emergency clothing ready to sit out the chill wind that was on the summit of Pendle. An hour later the air ambulance came to airlift Mark off to hospital. Ian then ran back to race HQ but taking a detour to allow them to enjoy the tortuous second half of the course. The first Calder runners back appear to have been mile muncher John Allan in about 2hours 50 minutes and Catherine Holden in about 3 hours 30. More details to follow when the results are released. A new fell race on the calendar, the 5 mile Litton Birks Fell Race goes from Littondale up in the Dales, to the top of the 607m Firth Fell and back. With a £5 entry fee, a chip butty and a bottle of beer for all runners, what more could you want from a fell race? With 70 runners Calder’s Jo Waites was second woman back in 44.34 just behind Kirsty Hall of Wharfdale. Steve Smithies was first Vet back in 6th place. Ted Mason of local club Wharfdale won.